Introduced species invade hardwood hammocks, outcompeting many native species. Introduced species invading the hammock habitats of south Florida include aggressive vines as well as shrubs and trees that outcompete native vegetation. Melaleuca quinquenervia, commonly referred to as melaleuca or broad-leaved paperbark, poses the greatest threat from an introduced species to the Everglades. Loss of large amounts of water through the leaves of this tree results in the desiccation of marsh areas. This, along with its extreme tolerance of fire, inflicts major changes to habitats of the Everglades. The Australian pine, (Casuarina equisetifolia), introduced from Australia into the Everglades during the late nineteenth century. Growing along shorelines and islands, it quickly became established and is currently found throughout south Florida. 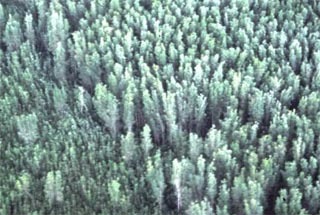 This pine has shallow root systems and suffers damage from the frequent storms as well as soil erosion. The Brazilian pepper, (Schinus terebinthifolius), was originally introduced as an ornamental plant. Its range has been extended primarily through seed dispersal by birds. 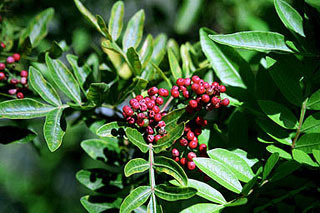 As an invader of pinelands, sawgrass marshes, coastal prairies and hammocks, the Brazilian pepper poses a serious threat to the native flora and fauna of the Everglades region.